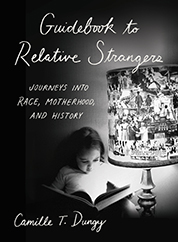 Camille T. Dungy is the author of the new essay collection Guidebook to Relative Strangers: Journeys into Race, Motherhood, and History. 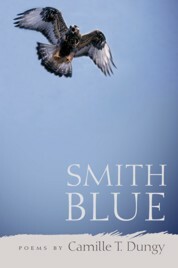 Her other books include Trophic Cascade and Smith Blue. 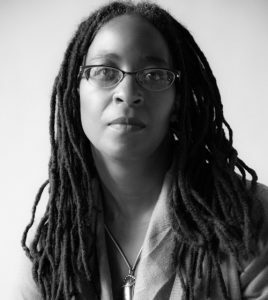 She is a professor of creative writing at Colorado State University, and she lives in Fort Collins, Colorado. Q: How did you choose “Guidebook to Relative Strangers” as your book’s title, and what does it signify for you? A: One of the first essays I wrote for the book was "A Good Hike." In it, I find myself in the midst of a precarious situation. As I wrote in the essay, "The group of people on whom I found myself dependent were relative strangers," but thanks to their care and attention I was able to reach safety (and I got a great story too!). As I continued the journeys that informed this book, I began to understand the importance of developing community with the relative strangers I find around me all the time. From providing windows into our common histories to sharing unexpectedly delicious treats, writing this book was like penning a survival guide that made clear to me that the ability to thrive is dependent on finding ways to connect. Q: The subtitle focuses on three themes: race, motherhood, and history. How do the three coexist for you? A: I can't imagine how these could not be connected. The poet Emily Dickinson once wrote, "Today, makes Yesterday mean." Equally, tomorrow will be shaped by the decisions we make today. Who I am as a woman has evolved since I have become a mother. I am even more concerned about the ways in which history and the present will direct my child's future. Because I am a black woman in America, my concern is heightened even further because of the many ways the legacies of our history still guide us today. Q: You begin the book with a description of an interaction at an artists’ retreat. Why did you choose that as your starting point? A: One of the truths about opening my life to relative strangers is that my sense of self is frequently challenged. I am a writer. That part of my identity has been key to me for all of my adult life, and well into my childhood. At the artists' retreat I wanted to compartmentalize my experience and put the artist side of me first. But that wasn't going to be possible. Other parts of my identity were called upon, sometimes tested. My race, my gender, my interest in history and its influence on contemporary social structures. All these parts of who I am and what I care about were called upon despite the fact I wanted to just slip away and be a writer. It becomes clear that, for me, writing can't happen in isolation from these other parts of my identity. In the opening essay and throughout the book, I write about what it means to represent all these selves. Q: Given the current political climate, what do you see looking ahead when it comes to the issue of race in the United States? A: I have to live in hope, because my own life and my family's life is at stake, but I am also very concerned. I know that this country, that the whole world, has been through divisive and repressive phases before. I understand that some of those moments in our history still haunt us fundamentally today. I have to stay alert and attuned to the dangerous climate, and I have to work to actively resist it. There is quite literally a storm gathering outside my office window as I type this response. Thick gray clouds cloaking the sun, branch-bending wind, occasional flashes of lightning, that barometric depression that always threatens to give me a migraine, heavy raindrops and pebble-sized chunks of hail. This storm will pass. I can hope we will stay safe. But I can't pretend it is not happening, that it is not potentially very dangerous. I have to acknowledge that if proper precautions aren't taken (and even in some cases despite our best efforts), a storm of this magnitude can cause irreparably devastating harm. A: As I said above, I identify as a writer, which means I am nearly always writing. Though I am not always writing a thing. It takes a while for a gravitational pull to develop around new work. 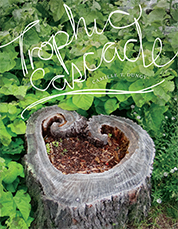 This year I've published both a new collection of poems, Trophic Cascade, and the essay collection Guidebook to Relative Strangers. I am writing, but I'll have to write a lot more in order to refill the well. A: Thanks so much for spending this time with my words!!!! Much of Guidebook to Relative Strangers is about what I have discovered about myself and my country while traveling to give readings and lectures. I am part of what one of my grandmother's favorite poems calls "a great, wide, beautiful, wonderful world." I am honored to have been able to write about it. I still love traveling and discovering the ways I can form deep connections with relative strangers. If you want to know if I'll be in your area, come visit my website!